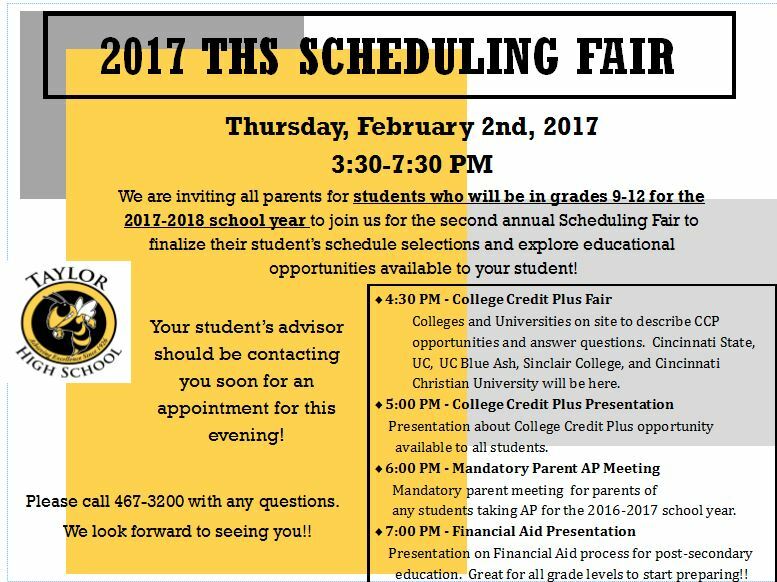 Megan Rivet, principal of Taylor High School, invites all upcoming grades 9-12 students to the Scheduling Fair this on February 2nd. If you do not already have an appointment, please contact the main office and they can set it up, or just come that evening. This event is intended for all soon to be 9th through 12th graders for the 2017-18 school year to discuss classes with students' advisor, counselors, and teachers. There will also be area colleges and universities present to talk about CCP (College Credit Plus) opportunities. We will be having a CCP presentation at 5:00pm, a mandatory AP (Advanced Placement) parent meeting at 6:00pm, and a Financial Aid Presentation at 7:00pm. It’s never to early to start financially planning for college, so please stick around for all of this great information. We hope to see everyone Thursday evening to start planning for next year!